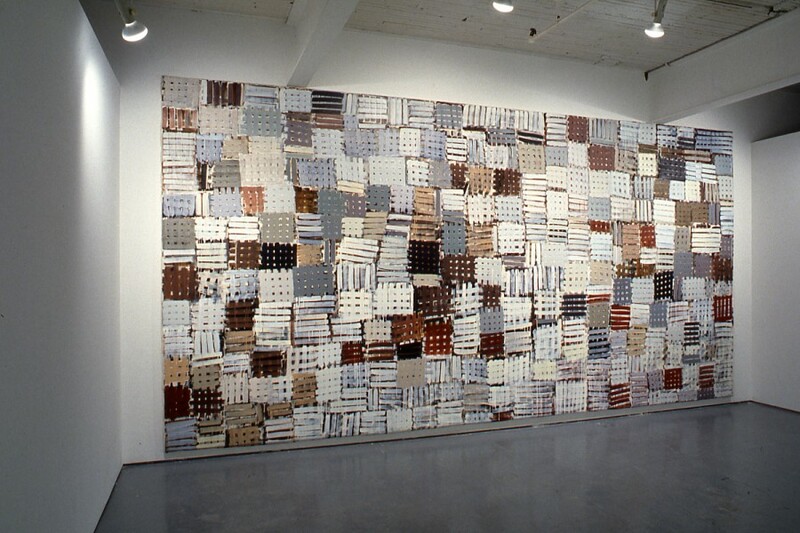 Denyse Thomasos’ Recollect, 1993, is a mural (scaled 19 x 18 foot) painting that virtually covers the largest of the Mercer Union Project Room’s walls. This work continues Thomasos’ interest In making paintings that evoke architecture, and/or work in conjunction with a specific architectural setting, to give visual form to the representation of African American culture and history. Recollect is divided into a grid composed of squares defined by repetitive, individual brushstrokes each measuring approximately ten inches. These brush marks are built up in semi-transparent layers, echoing the grid’s horizontal and vertical axes, to create a simple woven pattern. 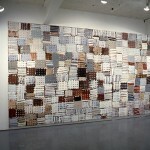 The resulting textile motif is suggestive of very limited spatial recession. 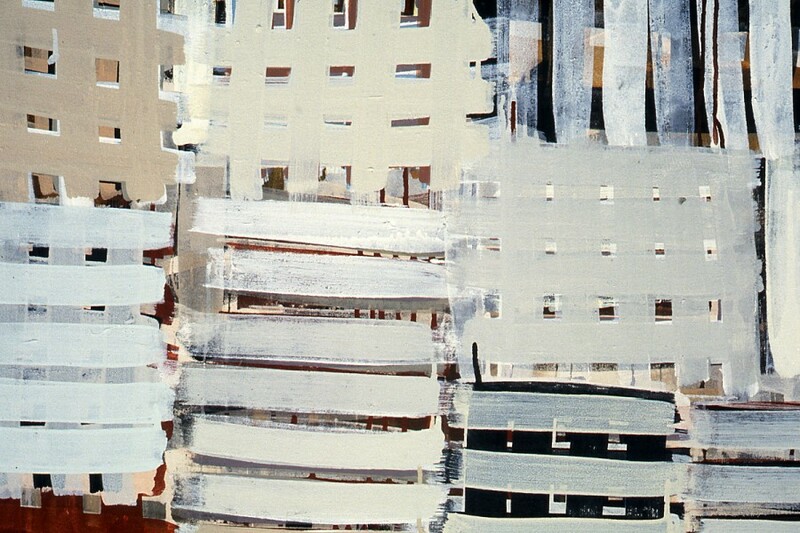 This sense of restraint is repeated in the thin paint and in the dry palette of muted taupes and greys Thomasos has used. The overwhelming presence of the artist’s hand labour isolates the physical – the painting’s manufacture – downplaying visual pleasure. Thomasos’ foregrounding of labour and the painting’s presentation in the limited space of the Project Room create a sense of confinement that alludes to the architecture of slavery. Other recent paintings have more specifically recreated the restrictive structures of slave boats and Jails. This work seeks to establish a loose relationship to West Afrlcan embroidered raffia pile-cloth the artist has seen. Raffia becomes brittle with wear and age. Thomasos thinks of this painting as a gesture of optimism, addresslng the value and fragility of transported culture. Permanent murals by Thomasos may be viewed in the lobby of Sydney Smith Hall, University of Toronto, (Silent Undercurrent, 1987), and in the entrance foyer of Erindale College in Mississauga, (Till the River, 1986). Born in Trinidad, Thomasos immigrated to Toronto in 1970. In 1989, Thomasos completed Yale University’s M.F.A. Program. 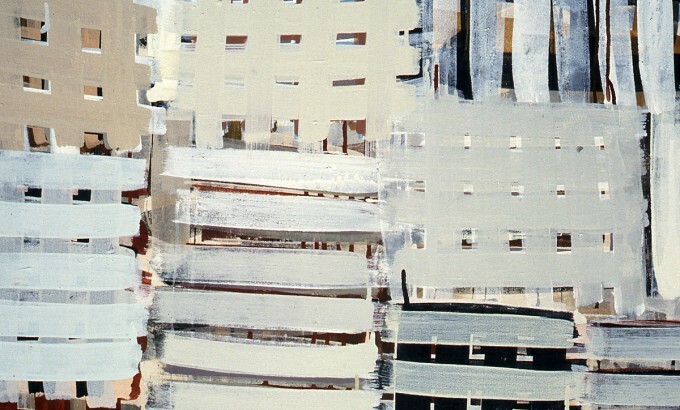 Since 1989, she has instructed painting at the Tyler School of Art, Temple University, in Philadelphia. PuritanismÑa legacy of shame, the prohibition of pictures, flesh under wraps, and witch-hunts and busted careers in hamlets like Salem, Mass. and Martensville, Sask. Ñ is still with us, 350 years after Oliver Cromwell closed the English theatres. If there’s an upside to it at all, it’s the resistance that it’s always faced, Punk being only tbe most recent manifestation. Common to the resisters has been an insistence on both dredging up the side of social life Ñ what’s been repressed Ñ and satiricaliy eroticizing its oppressive sign systems. A principal site for this activity has been clothing, an art form with the possibility of being visual, cheap and referring closely to that most proscribed subject: the living body. It’s an art that involves textile, texture, graphic image and cutting to !he body’s contours Ñ in other words, it has a lot in common with painting and sculpture. Neil MacInnis, a Montreal artist whose craft includes weaving, has produced an exhibition at Mercer Union that raises pertinent questions about the distance between clothing, the other textile-based arts and “high art.” In an installation consisting of a text, floor piece and wall panels, he uses patterned fabric as the metaphorical and literal centre of a discussion about HIV and the relationship of gay men to the North American body-politic. The plece is demystifying in ways you always hope art will be but rarely find it is. The text is a rag-paper printed version of At A Safe Distance / Textile As Transitional Object</>, originally produced for a Banff publication, The City Within. It’s a speculation on clothing and fabric in general, the way it functions, like electricity, as an invisible enironment, and the special association it has had in the public imagination as well as for the artist personally, with homosexual men. lt ends with the virus itself, which I haven’t seen diagrammed before, and a simple cartoon of the way it penetrates the blood system around it. The diagram carries over to the floor piece, where it’s reproduced in graphite on a purpie bedsheet, beside a Victorlan floral design. Framing these are squares of fabric that combine a manufactured design with designs generated by the artist on a knitting computer. On square wall panels, hanging in two rows, are tartans that the artist has invented and handwoven: ‘The Gaybashing Tartan,” all violent pinks and lurid, blue cross weaves, and “The Gay Nineties Tartan,” subdued and proud. This is a nice use of tartan, which originated under Bonnie Prince Charlie as a gaudy, rebel accessory and went on to be a versitle, commercial fabric, similar to paisley in its ubiquity (notwithstanding sneaky efforts of vendors at different times to turn it into something snobbish. lf you can’t say something nice about grunge, at least admit it looks stupid when Versace tries to do it). 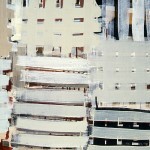 Denyse Thomasos’ Recollectis a 9 by l8 foot painting on view in the other gallery. It’s also about fabric, but in this case memory of it, specifically West African raffia pile-cloth. The colors she uses are muted earth-tones like burnt siena, umber and grey Ñ she applies them in patches of cross-hatching. A Trinidadian Canadian, Thomasos intends the work to refer to the architecture of slavery, the boats and jails, etc. While it doesn’t do this on any literal level, I’m quite prepared to accept the shorthand referencing; in painting, what you see is not always what you see, pace Frank Stella. As an African-born Canadian, the motif instantly jumps out at me as some thing African, and the visual rhyme with Robert Motherwell’s Little Spanish Prisonseries establishes the continuity of abstract painting talking about the confined space of the canvas as imprisonment. In spite of its oppressive subject matter, this work is open, airy and delightful to the eye. (You can see her permanent murals in U of T’s Sydney Smith Hall and Erindale College). Proof again of the power of image to re-image the architecture of doom.